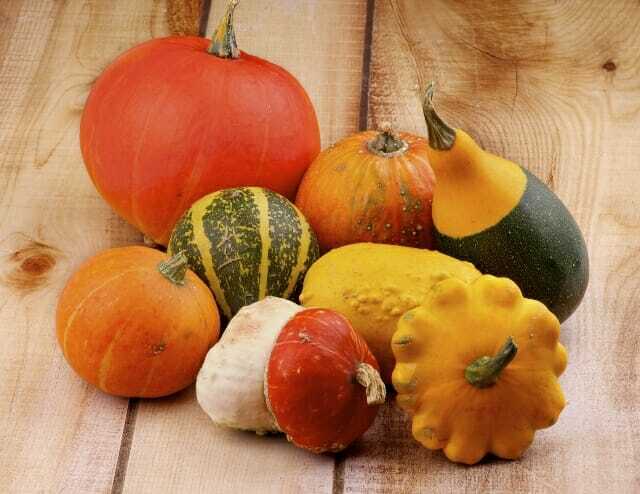 Versatile, variety, and nutritious are all adjectives that can be used for winter squash. Whether you grew your own, or buy them from local farmers and markets, consider putting some up for winter. With proper storage of squash, you’ll benefit from their fresh flavors for months—often until next spring– as well as the nutrition of these vegetables. Butternut is another of the more commonly seen and used winter squashes, having a distinctive elongated pear shape—long neck and bulbous base– with tan rind. The flesh has a sweet and nutty flavor, and is bright yellow-orange. Similar to the acorn, roast it, mash it, or make into soup. It’s easier to deal with cutting the neck from the base, and handling each separately. To remove the hard rind, use a vegetable peeler once it is roasted. Kabocha is a Japanese type of winter squash (this being the generic name for squash in Japanese), similar to the buttercup in appearance and coming in green or red. The deep yellow flesh is flaky but sweet, good roasted or baked with plenty of butter or oil. 11/1/14 Distribution of this release is made possible by University of Vermont Extension and New England Grows–a conference providing education for industry professionals and support for Extension’s outreach efforts in horticulture.